At West Campus Dental – We Want You To Become Our Patient! It is important to us that your visit is unlike any other dental appointment you have ever experienced before! From the moment you walk into our office and are greeted by our administrative team, we want you to feel comfortable and welcome. Your examination appointment time will be a one-on-one visit with Dr. John Schmidt. He will take all the time necessary to discuss your dental health levels, needs and goals as well as answer any questions you may have. During your examination, we will help you to clearly see and easily understand what is going on in your mouth. All of your options will be explained to you thoroughly, even if you choose no treatment at all! During your visit, we will also be focusing on your overall dental health. We want to help you understand your dental health and how it relates to your overall general health. We will ensure that all of your questions and concerns are addressed. There is no pressure to proceed with any procedure unless you are totally comfortable with and completely understand the need for the procedure, the timing of the procedure, and the steps involved. 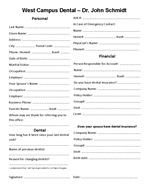 At West Campus Dental, we know your time is valuable, and we have posted many of our forms online so you can download them yourself, print them off, and fill them out at your convenience prior to your first appointment in our office. We will make every effort to keep your visits as efficient as possible and try to ensure that they start and end on time. We also try to follow up with you after every visit so that you can provide us with your feedback as to how we can further improve our efforts to meet the needs of all our patients. Our goal is to keep you aware of your dental health realities. To accomplish this, we want to keep in touch with our patients by means of whatever technology they are most comfortable with, whether that means using email, text messaging or even a simple phone call. We believe that effective communication is crucial in helping each and every one of our patients achieve his or her dental goals. Call us at (403) 282-3380 to contact us today!